Pietermaritzburg, 16 July 2018. Even before construction has been fully completed, the iconic Mt Edgecombe Interchange north of Durban has won a prestigious award from the South African Institution of Civil Engineering (SAICE). 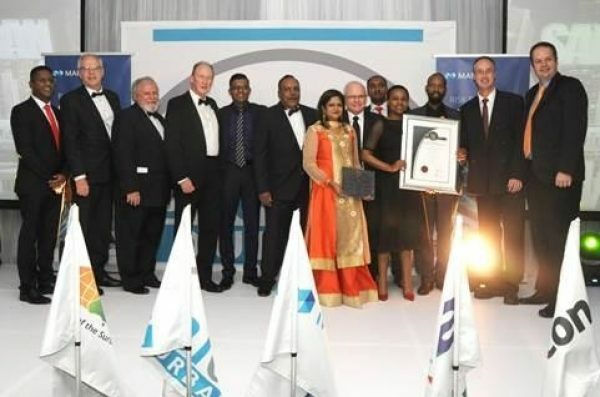 The SAICE Durban Branch Award for Technical Excellence in Construction was given because the interchange is considered to be “an outstanding example of technical expertise and quality which has contributed substantially to the transportation experience of the public and the economy of the region”. The entry will now be submitted to the SAICE National Awards for Technical Excellence in Construction. Currently the largest interchange project in South Africa, the Mt Edgecombe Interchange is also located in one of the fastest developing areas in the country, a factor that played a major role in the conceptual design of this upgrade to ensure that the interchange would aesthetically complement its fast-paced modern surroundings; stand the test of time in terms of life-span; and deal with ever-growing traffic demands. The interchange which is being upgraded by the South African National Roads Agency SOC Limited (SANRAL) is estimated to reduce travel time from 25 minutes to one minute on average. The project which started in April 2013 is within weeks of completion. In total nine bridges and 11 kilometres of ramps were built. A total of 480 piles were used and 1.8 km of mechanically stabilized earth walls were erected. The state-of-the-art lighting incorporates 400 light bulbs. To improve the safety of pedestrians, a 432m long pedestrian bridge has been constructed over the N2 and connects to new footways.Corné Roux, SANRAL Eastern Region Project Manager: Pavement Design Support said the multiple engineering achievements behind this mammoth project are testimony to the exceptional skill and abilities of the entire construction team. The project engaged 80 designers at the peak of the design phase. Not a single road was closed permanently during construction. The Incrementally Launched Method of bridge building was used, so as to create as little disruption to road users. A defining feature of this project is that it was one of the longest bridge viaducts ever constructed in South Africa. This viaduct, referred to as B0215, has a deck length of 947 meters, which also makes it one of the longest incrementally launched bridges in the Southern Hemisphere. The total cost of the project was set at just over R800 million but with escalation, the total contract expenditure is estimated at R1,136 billion, including VAT.The maximum number of persons employed at a time by the contractor and sub-contractors was 803 of which 724 were from the eThekwini target area, with a total of R240 million being spent on wages so far. R684,770.00 has been spent on training 461 people on subjects such as steel-fixing, scaffolding erecting, operating construction equipment and various safety, engineering and entrepreneurial-related training. A total of 31 sub-contractors have been employed with work to the value of R59 million performed by 21 SMMEs to date.